I watched the film "walkout" two nights ago and was really impressed with the quality of the film. One of the most important scenes in the film is when the students are watching the TV news version of the first walkout during which the police beat the sh** out them. The TV news reported that there were student disturbances but that the police were able to get them under control, indicating that the students started the violence. It was a complete misrepresentationof what happened. The movie was extraordinarily powerful and eloquent on how violent the police were and how the media distorted the event. This happens ALL THE TIME! Think about what happened at Thurgood Marshall HS here in SF and how the district and media spun it!! 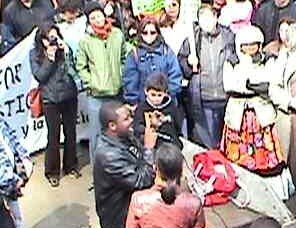 This is why one of the civil rights veterans who trained people in non violent direct action explains to our SF Freedom School students (when he is a guestspeaker at our sessions) to not count on the media at all, in fact its best that they aren't around, since they will distort what you are doing. He has many experiences and good theory to back up this point. The movie "walkout" also pointed out that the surveys that led to the walkout had been given out 3 years before and "didn't work." That is another important lesson to learn. That the first time you try something, if it doesn't work,that doesn't mean it won't work. It means that it needs to be tweaked or it wasn't the right time. Another example, those who organized the montgomery bus boycott had tried to do so several times. They learned from each failed attempt so that they finally got it right, at the right time. I believe that the more we understand how social movements developed in the past, the better and more effective the next one will be. They have the monopoly of violence, the media, money and patronage. We only have people power. and to tap into it we need to be smarter and more organized than they are. The spirit of Cesar Chavez lives on in the struggle for union rights and justice in the fields of California. Along with Dolores Huerta, Philip Vera Cruz, and others, César created the United Farm Workers (UFW) the first successful union of farm workers in U.S. history. There had been more than ten prior attempts to build a farm workers union. The United Cannery and Packinghouse Workers (UCAPAWA) organized in the 1930's, the National Farm Workers Union (NFW) led by Ernesto Galarza tried to organize Farm workers in the 40's and 50's. In 1959, the AFL-CIO tried to organize again with the Agricultural Workers Organizing Committee (AWOC). AWOC had several weaknesses, including a top down leadership selected by AFL-CIO leaders, not by farm workers, and a strategy of working cooperatively with labor contractors. AWOC continued the prior efforts of Ernesto Galarza and the NFW in struggling against "braceros" or guest workers, contract workers imported from Mexico, from breaking strikes. A renewed "guest worker" bill is presently before Congress. Each of the prior attempts to organize farm worker unions were destroyed by racism and corporate power. Chávez chose to build a union that incorporated the strategies of social movements and allied itself with the churches, students, and organized labor. The successful creation of the UFW changed the nature of labor organizing in the Southwest and contributed significantly to the birth of Latino politics in the U.S.
Today, under the leadership of UFW president Arturo Rodriguez, over 28,000 farm workers enjoy benefits on the job. They are incorporated into California's educational, health and civic communities. The UFW has shown the AFL-CIO that immigrants can and must be organized. In 2002 we won significant victories in the legislature and numerous elections. César Chavez, Dolores Huerta, Philip Vera Cruz, and others deliberately created a multiracial organization, Mexican, Mexican American, Filipino, African-American, Dominican, Puerto Rican and Arab workers, among others, have been part of the UFW. This cross racial organizing was necessary in order to combat the prior divisions and exploitations of workers based upon race and language. Dividing the workers on racial and language lines always left the corporations the winners. In the 60's Chávez became the pre-eminent civil rights leader for the Mexican and Chicano workers, helping with local union struggles throughout the nation. He worked tirelessly to make people aware of the struggles of farm workers for better pay and safer working conditions. It is a testament to Cesar Chavez's skills and courage that the UFW even survived. They were opposed by major interests in corporate agriculture including the Bruce Church and Gallo Corporations as well as the leadership of the Republican Party then led by Ronald Reagan. Workers were fired, beaten, threatened and even killed in pursuit of union benefits . Non union farm workers today continue to live on sub-poverty wages while producing the abundant crops in the richest valley, in the richest state in the richest nation in the world. In response to corporate power, Cesar developed new strategies, such as the boycott, based upon his personal commitment to non-violence in the tradition of Ghandi and Martin Luther King Jr. César Chavez died in his sleep on April 23, 1993 near Yuma, Arizona. Today Mexican, Mexican American and Puerto Rican union leadership is common in our major cities and in several industries. For myself and others, the UFW was a school for organizing. Hundreds of activists in labor and community organizations owe their skills to UFW training and experience. Along with improved working conditions, salaries, and benefits, training this cadre of organizers remains a major legacy of the UFW. 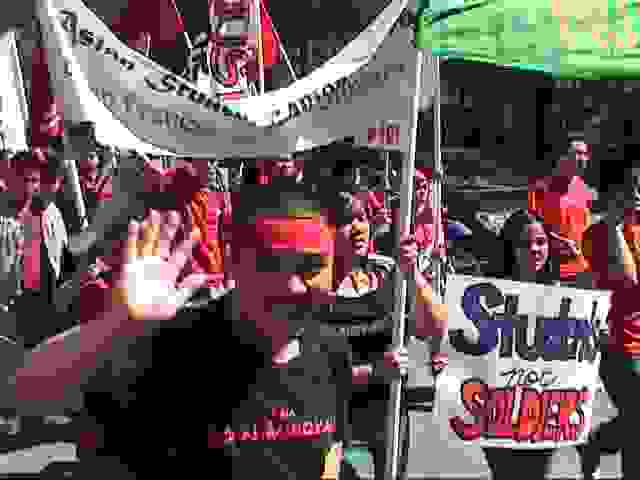 San Diego immigrant and police accountability groups like the AFSC - American Friends Service Committee are calling for solidarity with student activists who are facing a crackdown by San Diego police because of their blowouts/walkouts over the past few days. Local affiliates of the SouthWest Network for Environmental and Economic Justice or SNEEJ and Grassroots Global Justice like AIWA, PODER and the Chinese Progressive Association have worked closely with Jose Bravo from San Diego. See the call to Action below. 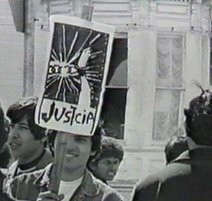 Historical note: when students from East LA high schools organized their March 1968 blowouts or walkouts of Wilson, Lincoln, Roosevelt, and Garfield High Schools with support from students from many other schools they faced the same kind of police and school district repression that the current students are facing today. 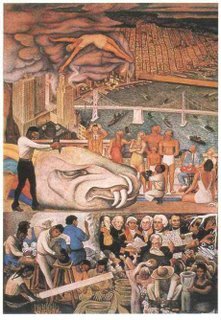 But at its height in 1968 the blowout movement counted somewhere between 10,000 to 15,000 students, according to LA 13 veteran and UCB Prof. Carlos Munoz in his chroncle of the Chicano Movement "Youth Identity and Power" [Verso 1989]. See also Brown Beret founder Carlos Montes' reflection on the making of the 2006 HBO film Walkout. 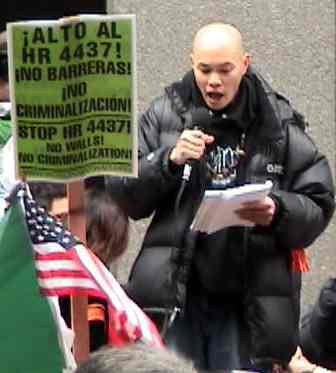 Montes was also arrested as one of the LA 13 in addition to Munoz, and David Sanchez and Moctezuma Esparza and others portrayed in the HBO film. Today's youth protests are clearly much larger and widespread. 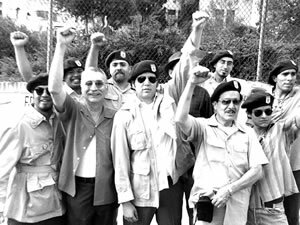 The LA based Brown Berets and UMAS [United Mexican American Students] supported youth movement in 1968 spread to schools in Denver and Crystal City Texas and were encouraged by Corky Gonzalez' [Crusade for Justice] and Reies Lopez Tijerina and other movement leaders. At the college level students at San Jose State held walkouts later that year, and the Mexican American Student Confederation - MASC - at San Francisco State and groups at UC Berkeley helped to form the multiracial Third World Liberation Fronts on those campuses to shut them down from November 1968 through the Spring of 1969 over demands for student power, fair admissions and student support programs, Ethnic Studies, an Autonomous Third World College and community control over education. 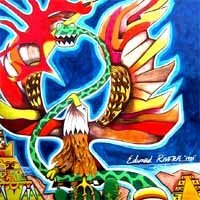 The establishment of Chicano and La Raza Studies and Ethnic Studies at many campuses up and down the Southwest were, in part, a result of the walkout movement begun in East LA by high school students and the growing Chicano movement. But it appears that today's walkouts are more massive, spontaneous and widespread - thus the intense crackdown by police and school districts. Subject: Emergency call to action! Pass it on! San Diego Police are in the process of Intimidating, brutalizing and arresting hundreds of students right now as I write this email. Many are being held by the SD Police Department in the a sub-station in Barrio Sherman (Sherman Heights) next to Barrio Logan. Cristian Ramirez / Cesar Luna and other people mobilizing for their release and legal representation. We need your help urgently. Call the SDPD and demand an end to the violence on students from Memorial Jr. High. If people need to contact Cristian Ramirez with AFSC at the scene or can get press to contact Cristian here is the number 619 885-1289 Cell. In the wake of the crackdowns on the massive immigrant rights demonstrations of the past week, the immigrant solidarity network and other immigrant agencies are working to support the students from California schools that walked out of classes in protest the racist anti-immigrant bills that passed in the House and are now being debated in the Senate. Los Angeles' two top law enforcement officials Tuesday vowed a crackdown on students who walk out of class as authorities struggled to quell a third day of widespread demonstrations against immigration policy. joint news conference that their agencies would begin aggressively enforcing truancy laws. Bratton said his officers will now cite any students found out of school, requiring them to appear in court. The citations could result in fines of up to $200 and 20 days of community service. 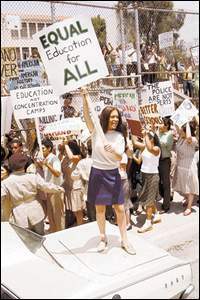 Despite school district officials efforts to prevent the walkouts with 'lockdowns' and other tactics, the students continued their 'blowouts' in the tradition of the 1968 demonstrations against racism and inequality in East LA schools which was recently dramatized by Edward James Olmos' HBO film Walkout. LA Officials reported more than 11,600 students from throughout the county were involved in the Tuesday protests — compared with more than 30,000 on Monday. The LA-based Immigrant Solidarity Network is giving useful information for student protesters and their supporters. The Midnight Special Law Collective also has produced excellent materials to help young people and community groups understand their rights, including a really useful comic book on the rights of students in school. LA's chapter of the National Lawyers Guild also has a great pdf file outlining our general rights to protest. Yes. The First Amendment of the U.S. Constitution and Article 1, Section 2 of the California Constitution guarantee freedom of speech and freedom of the press to all people, including students. In addition, two special laws in California specifically protect students’ rights of freedom of speech and freedom of the press at school. Go here for the full report. In a clear reversal by city officials, educators and police, student protesters today faced campus lockdowns, arrests and threats with both Mayor Antonio Villaraigosa and Schools Superintendent Ray Romer threatening consequences to further student protests and "truancy." Police have made it clear they will no longer tolerate traffic closings and freeway protests. In a driving rain, thousands of students again left their campuses, often climbing over school fences, and targeted government buildings, freeways and streets calling for no government attacks on their families, neighborhoods and communities. At Carson High School police firmly brought to the ground a student protester, handcuffed him and booked him. The behavior of police was clearly an angry and brutal response. Several arrests at Carson High and in areas around high schools were reported. At a joint press conference, Mayor Villaraigosa and School Superintendent Ray Romer firmly told students to stay in class or face the consequences. Romer said that families which did not have their students in class may be called in for conferences. He mentioned that the senior class should especially not take part in the protests, sending a threat about graduation participation. Arrests took place on two freeways where traffic jams were created by students blocking the highway. Live television coverage showed ten or twelve students lined up, facing the cement wall of the freeway, handcuffed and being prepared for transfer to a police station. A heavy rain did not deter 200 students from again gathering at City Hall but no arrests or incidents were reported there. Numbers of protesters were down significantly from yesterday but the militancy remained high. But somestudent leaders, probably encouraged by school authorities, encouraged students to remain on campus. The general theme was "We've made our point; now we might be hurting ourselves." 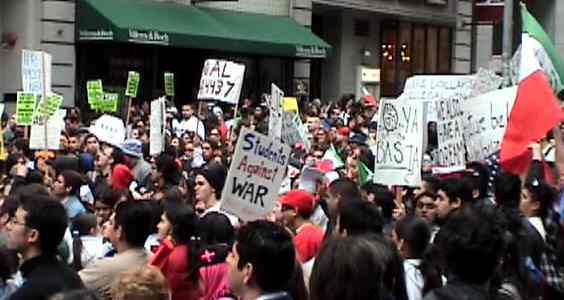 Students here in Los Angeles, obviously motivated partly by the 600,000 to 700,000 people who marched last Saturday, have stunned city officials and police with their organizing and militancy. Overwhelminglythe student protests have been non-violent, well-organized and clearly focused on the issues, with signs and banners often targeting the House version ofthe legislation which calls for building a wall on the border, making felons of immigrants and criminalizing those who help undocumented immigrants. When asked about the Senate Judiciary Committeeaction yesterday, which some organizers have describedas positive, one student remarked, "We know that canbe reversed." Politicians write teacher credentialing rules? In a prior posting I asked if anyone knew about an Omnibus teacher preparation bill. The bill is Senate Bill 1209. I encourage careful reading of this bill. 1. Consolidating pre service testing from Rica to CSET. 2. Elimination of current restrictions that teacher performance assessment would only begin when the budget provided funding for such assessment. 3. Item 8. Eliminates the current provisions that a teacher could appeal an adverse decision by a Principal. 5. Appears to sharply limit the use of Emergency Credentials. (13) Existing law requires each school with a substantial population of pupils of diverse ethnic backgrounds to provide an in-service preparation program designed to prepare teachers and other professional school service personnel to understand and effectively relate to the history, culture, and current problems of these pupils and their environment as specified. This bill would delete this and the related provisions. 8 9 10 11 12 13 14 15 16 17 18 19 20 21 22 23 24 25 26 27 28 29 (c) Completion of coursework in human relations in accordance with the commission’s standards of program quality and effectiveness that includes, at minimum instruction in the following: (1) The nature and content of culture. (2) Cross cultural contact and interactions. (3) Cultural diversity in the United States and California. (4) Providing instruction responsive to the diversity of the student pupil population. (5) Recognizing and responding to behavior related to bias based on race, color, religion, nationality, country of origin, ancestry, gender, disability, or sexual orientation. (6) Techniques for the peaceful resolution of conflict. (d) The commission shall establish alternative requirements for a teacher to earn the certificate, which shall be awarded as a supplementary authorization pursuant to subdivision (e) of Section 44225. (e) A teacher who possesses a credential or permit described in paragraph (1) of subdivision (b) and is able to present a valid out-of-state credential or certificate that authorizes the instruction of English language learners may qualify for the certificate issued under this section by submitting an application and fee to the commission. For one thing, this looks again like politicians writing rules for the profession, much as they did in mandating the current reading programs. I encourage others to look at this bill. What do others think? At the California State Building in San Francisco at noon today California Speaker Pro Tem Leland Yee [a former SF Board of Education commissioner] stood with dozens of Asian and Pacific Islander and Chicano/Latino organizations to call for unity among Chinese, Asian and Latino immigrant commuities. Assemblymember Yee is introducing a bill in the state legislature that will support human rights for all immigrants. Bay Area Immigrant Rights Coalition director Sheila Chung was there with me and Chinese Progressive Association Chairman Leon Chow and dozens of seniors from the Community Tenants Association to call on our communities to continue to demand dignity and justice for all immigrants. Yesterday SF Immgrant Rights hunger strikers ended their weeklong fast with a demonstration at Senator Diane Feinstein's downtown office. 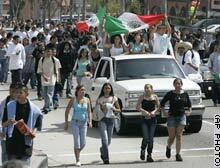 They also united with the Latino Peace activists that finished their 241 mile march for peace also in the City. Watsonville, Santa Cruz, Monterey immigrant communities and supporters stand up to the racist anti-immigrant attacks. In Fresno, the immigrant rights marches and walkouts by high school students are growing in strength and numbers. On Monday there were over 500 students at the march and rally. Today the estimates were as high as 6,000. Immigrant Rights - The Protests and Walkouts are Growing Larger in Fresno By Mike Rhodes Estimates of the number of students at the immigrant rights marches and rally in downtown Fresno ranged wildly today. The Fresno Police Department captain on the scene estimated 2,000. The Reverend Floyd Harris, president of the California chapter of the National Action Network, estimated 6,000. What was certain is that thousands of students made their way downtown today, in the pouring rain, to protest against the anti-immigrant HR 4437 that is being discussed in Congress. The march and rally was significantly larger than the spontaneous walkout and march, led by student activists yesterday. See http://www.indybay.org/news/2006/03/1811395.php for the story and pictures from that event. Today the students came from almost, if not all, local high schools. 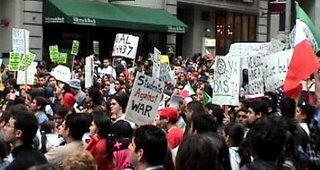 The students gathered at City Hall, held a rally, and marched to the Fulton Mall and back to City Hall. Shortly before Noon there were several splinter marches heading in various directions and you could hear chanting and the yelling of these massive marches all over the downtown area. Perhaps the largest contingent, once again, came from Fresno High. There arrival created an uproar from students who had already arrived that could be heard for blocks. One of the last groups to arrive was a group from Hoover High, which is at least 5 miles North of downtown. While there was a massive police presence, there was no evidence of arrests taking place at this peaceful rally and march. Marches In Watsonville and Salinas for Peace and Immigrant Rights! On March 25th, over 2,500 latino immigrants joined Gold Star Families for Peace member Fernando Suarez del Solar, and Iraq War resister Pablo Paredes for the 5 mile Watsonville leg of their 241 mile march for peace from Tijuana to the Mission District in San Francisco. Along with chants for peace, many on the march were also moved to take a stand against the draconian anti-immigrant bill HR4437. photos: 1 2 3 4 5 6audio: Short Interviews After the march, the Watsonville Police Department targeted one organizer (a Brown Beret) and wrote him a citation with 8-10 counts against him, including criminal charges. Read more Shortly after the march in Watsonville, a thousand latino immigrants joined Fernando Suarez del Solar and Pablo Paredes for the 5 mile Salinas leg of their 241 mile trek. 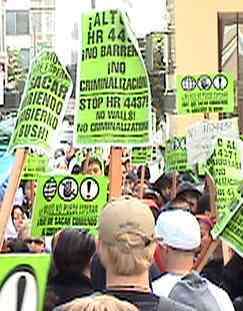 More than five hundred people joined rallies and marches against HR 4437 in Santa Cruz on March 17th. The rally started at the Santa Cruz County Building and then marched to Beach Flats Park, with the community running out of their homes and into the streets throughout the night. People then left the Beach Flats, headed up Pacific Avenue, and back to the County Building for a final rally of the night. 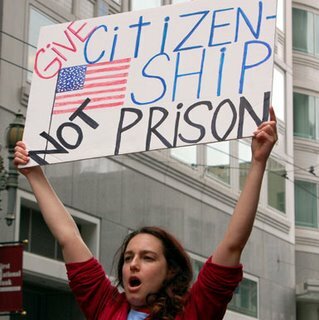 HR 4437 would make it a felony offense to be in the U.S. without proper documentation. This would push undocumented immigrants further underground, and increase the potential for exploitation by employers. This bill would also criminalize nurses, teachers, clergy, social workers, and anyone else who aids, assists, or otherwise has regular contact with undocumented immigrants. (protest announcement). 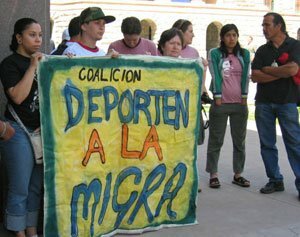 reportbacks: Por que somos emigrantes, Por que somos ilegales, si señor. Report from Friday's Marches and Rallies in Santa Cruzphotos: 1 2 3 4audio: Speakers from Santa Cruz Rally Against HR 4437observations: Sentinel has no online coverage of Friday's March for Immigrant Rights in Santa Cruz undercover cops at immigrant rights march? On Wednesday March 15th, over one hundred activists congregated at Dennis the Menace Park in Monterey to voice their opinion on the new HR4437 bill that had just passed in the House of Representatives and is now on its way to the Senate. The activists included students, community members, Brown Berets, veterans, and children. After a rally at the park, the demonstrators marched to Downtown Monterey (Alvarado Street) to tell the general public how they felt. As the protest moved towards downtown the number of demonstrators increased as they found more supporters to their cause. At one point the demonstration blocked one lane of the road as the demonstrators took to the street. 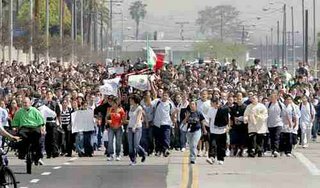 CNN and other news sources [http://www.libertypost.org/cgi-bin/readart.cgi?ArtNum=133985] reported more walkouts on Monday 3/27/06 not just again in Los Angeles High Schools but now spreading to other high schools throughout the state. Nearly 40,000 students from across Southern California staged walkouts to protest proposed immigration legislation Monday, blocking traffic on four freeways and leaving educators concerned about how much longer the issue will disrupt schools. 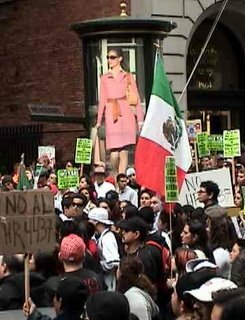 The protests are believed to eclipse in size the demonstrations that occurred during the anti-Proposition 187 campaign in 1994 and even a famous student walkout for Chicano rights in 1968. Some principals put their schools on lockdown Monday to keep students from leaving campus, and Los Angeles Unified School District officials said all middle and high schools will be on lockdown today. Monday's demonstrations appeared to start in Los Angeles but quickly spread to San Diego, Riverside, San Bernardino, Orange and Ventura counties. Though the protests were mostly peaceful, there were a few clashes and several arrests. in the 1000’s. There are also reports of walkouts in other school districts. The district is expecting more walkouts tomorrow. From the newswire: Students WALK OUT at Riverside high school LA school district is reporting 24,680 students have walked out Walkout in the West SGV Hundreds of Orange County Youth Protest Anti-Immigration Law! Peaking at about 5000 students, a demonstration Monday on the south lawn of City Hall in downtown Los Angeles was addressed by Mayor Antonio Villaraigosa as the youth chanted, applauded and waved banners and flags. His appearance from a City Hall door created a surge of students to the steps of the building. Earlier students poured into the City Hall lawnafter walking out of scores of local high school and middle schools to protest the immigration legislationnow in Congress. As each student contingent enter the area, deafening cheers greeted the newcomers. Richmond, Oakland and San Francisco High School and Middle School students turned out in the thousands in the pouring rain today to march with the immigrant rights organizations, faith-based human rights and grassroots social justice organizations, and to join the Immigrant Rights Hunger Strikers and the Latino Peace marchers at a huge demonstration at Senator Diane Feinstein’s financial district office. The San Jose Mercury News reported hundreds of students walking out of San Jose Unified and East Side Union school districts. Hundreds of immigrants and folks in solidarity rallied at San Jose City Hall later monday evening as well. Students who walked out from the Richmond, Oakland and San Francisco schools are representing a tradition of walkouts and ‘blowouts’ from the Civil Rights movement to the Chicano/Latino movements of the 60’s. 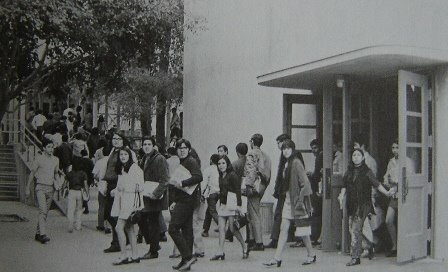 Asian American students at San Francisco's predominantly Chinese American Galileo High School also walked out at different times in the late 1960's over racism and an unequal education system for immigrants, working class, and students of color. For more on the HBO Edward James Olmos film Walkout which premiered on HBO earlier this month. See my earlier blog entries. 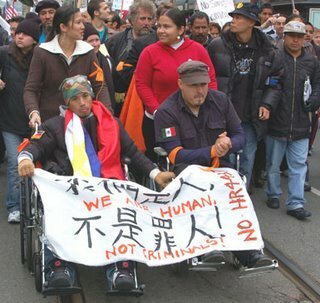 Pictured to the right is East Oakland Community High School co-founder Wayne Yang, one of the SF Hunger Strikers, who was supported at SF's rally today by his entire high school according to organizers of the protest. We are getting reports that school walkouts by Latinostudents are now taking place in San Marcos, San Diego, San Francisco, San Jose, San Antonio, Houston and El Paso. The Anti-war and immigrant rights movements seem to be converging more now not only with today’s uniting of the Latino Peace Marchers with the SF Hunger Strikers and their supporters but also with United for Peace and Justice in NYC and the ANSWER LA supporting and helping lead the historic Mach 26, 2006 Los Angeles immigrant rights march and rally. Tell Congress: Vote No on Sensenbrenner's, Specter's, or Any Other Anti-Immigrant Bill! Congress is on the verge of passing legislation that will decide how immigrants will be treated for decades to come. 11 million undocumented immigrants and those who help them get food, a job, or a home would be turned into criminals -- unless we act now! and click on "Senators" at the top left. Tell your Senator to vote NO on HR 4437, the Sensenbrenner bill, Senator Arlen Specter's bill, or any other version that retains anti-immigrant provisions. 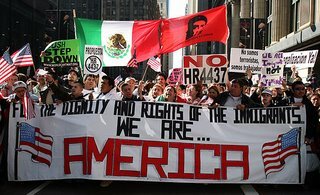 Instead of undermining civil rights and civil liberties, they should support immigration reform that enables undocumented immigrants to legalize their status and gain a path to citizenship, reunifies immigrant families, stops mandatory deportations and indefinite detentions, and supports the rights of all workers. End the war in Iraq -- bring the troops home! Unite for change -- let's turn our country around! That's one of the most amazing photos I have ever seen - from today's Sunday LA Times. 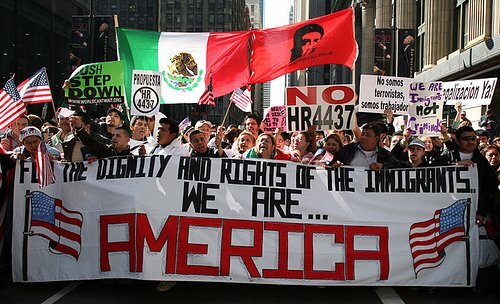 The Immigrant Solidarity Network has been doing a tremendous job with analysis and information about the growing immigrant rights movement throughout the United States. Though they are based in Los Angeles where the strongest base of the movement seems to be, they are also linked with organizations from Milwaukee [where 30,000 people marched and demonstrated for immigrant rights on 3/24/06] to Denver [where the mainstream press reported over 50,000 in the streets and folks are protesting a Colorado version of CA's Prop 187 which scapegoats immigrants]. More on Denver protest. In Sacramento, CA where at least 5000 marched, and in Stockton immigrant communities are also rising up. 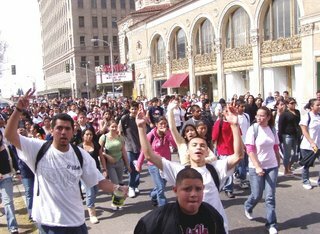 Also see the report from the Stockton Record - Hundreds take to the streets in protest of immigration bill Zachary K. Johnson Record Staff Writer Published Sunday, Mar 26, 2006. 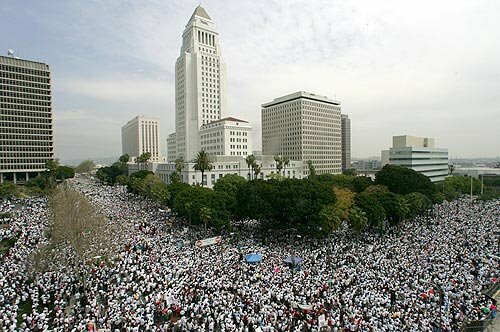 3/25: Los Angeles: Between Half-million to One Million People Protest against Anti-Immigrant Law! 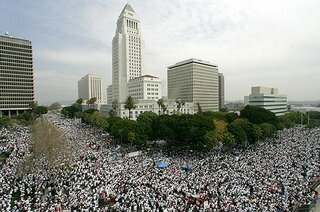 Today in downtown Los Angeles, over 1 million people demonstrated in support of immigrant rights. This was the largest demonstration in the history of California. March organizers announced from the stage that the crowd was over 1 million. Univision and other Spanish-language television reported that up to 2 million people marched. The Los Angeles Times, reflecting police estimates, gave the march 500,000 - police estimates have been trying to minimize pro-immigrant rights demonstration for the last few weeks. 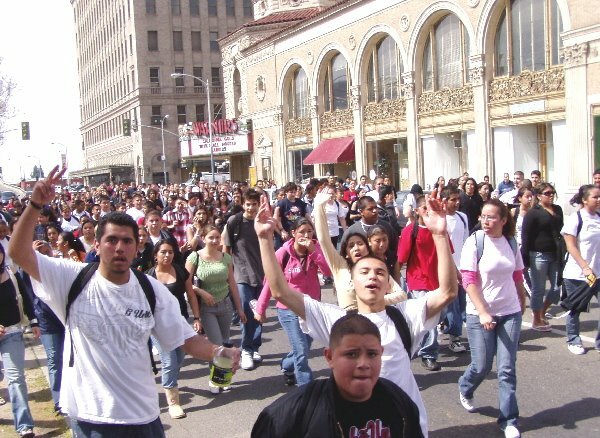 Over 1/2 a million marched in Los Angeles today, and following the tradition of the 1968 East LA High School 'blowouts' - thousands of LA high school students walked out in protest of the racist anti-immigrant legislation and attacks on immigrant communities. In San Francisco on Saturday longtime labor and social justice activist Bill Schwalb was also out for the national day of solidarity and to support the SF hunger strikers at the Federal Building. 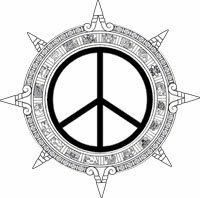 He has been working with the organizers of the "241 mile March for Peace" which began in Tijuana on March 12th and is ending Monday March 27 in Oakland and San Francisco. See our blog entry from a few weeks ago. The Chicano/Latino peace marchers will converge with the SF Immigrant Rights Hunger Strikers as well. At 10:30 am the Peace marchers will be at Laney College in Oakland. At Noon they are expected at the Montgomery BART station probably to join the Immigrant Rights hunger strikers for a demonstration at Senator Diane Feinstein's office at Montgomery and Market. The peace marchers also plan to gather at Dolores Park in the Mission District after 3:15pm and to close their 241 mile 'long march' at 5pm with a ceremony and celebration. Congratulations to the Chicano/Latino peace marchers for building stronger unity between the anti-war movement and the growing immigrant rights movement! Click here for the marchers' daily blog. 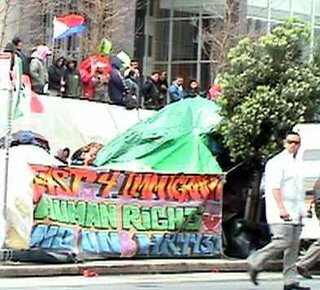 As hundreds of thousands marched and demonstrated in Los Angeles, Denver, Milwaukee, Tennessee and throughout the United States, hundreds of San Francisco Bay Area folks braved the rain and wind on the National Day of Solidarity to support the 30 or so immigrant rights hunger strikers who have been camping out in front of the Federal Building in San Francisco. At the rally Jeremiah Jeffries of Teachers for Social Justice and the SF People’s Organization raised the spirits of the hunger strikers with a great solidarity statement. “HR 4437 and the Specter bill are part of a long history of criminalizing and abusing and being hateful for people of color the world over,” he said. Jeffries teaches 1st grade at John Swett Alternative Elementary School in San Francisco not far from the Federal Building. The audience also listened to solidarity statements from activists in others states like Tennessee and Ohio and from queer immigrant rights activists. I saw another veteran from the 1995 SF hunger strike for immigrant rights, Edwin Rodriguez who was one of the leaders of CARECEN and the Northern California Coalition for Immigrant Rights in the 1990's. Edwin now does a TV show on Univision TV 14 [SF Bay Area]. Longtime labor movement leader Bill Shields who built the great labor studies program at City College of SF was at the rally to support one of his students who is a hunger striker. Several San Francisco state students are also hunger strikers. My colleagues Ethnic Studies Professors Andrew Jolivette [Native American Studies] and Clarissa Rojas [Raza Studies] from SF State University have been especially supportive of the student hunger strikers by bringing out their classes to the federal building to learn about solidarity and immigrant rights. On Friday, Colin Rajah from the National Network for Immigrant and Refugee Rights coordinated the solidarity action in the rain outside the federal building. Grassroots youth organizations PODER and the Chinese Progressive Association brought out young people to support the hunger strikers. 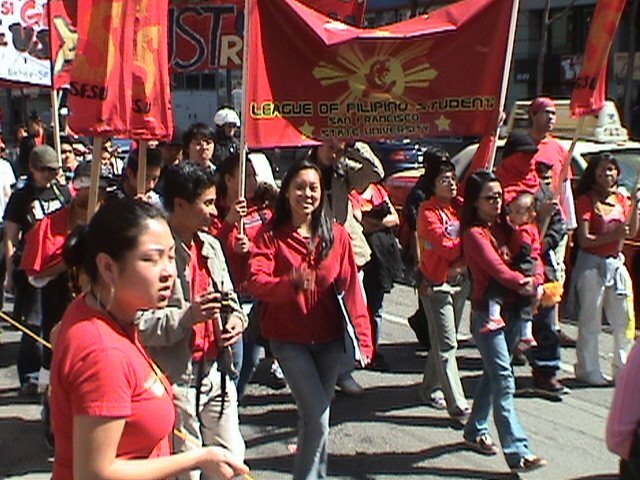 Filipinos for Affirmative Action, BAYAN and other Asian and Pacific Islander organizations are also supporting the strikers. Kawal Ulanday, Chairperson of BAYAN-USA joined the hunger strike on Thursday. It is our responsibility to even put our bodies at risk if this is what it takes to get those in power to act in a human way and recognize that being able to work and live in the United States with dignity and to provide food for your family here and for your loved ones who you haven't seen in years is a human right that must not be compromised or criminalized. 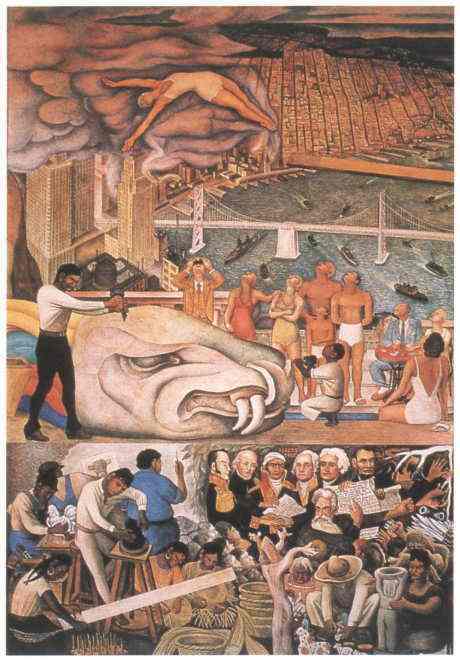 If there is any foreign presence to be questioned on a foreign land, it is the presence of trans and multinational corporations in the Philippines, South America and Mexico reaping super billion dollar profits from our homelands, crushing any hopes for national industrialization, jobs and the ability to keep our own resources to build self-reliant economies that provide jobs at home. Teacher and artist Jay Jasper Pugao from the East Oakland Community High School has been fasting for the entire week. We must be present here to represent the long-time struggle of our community and unity with other immigrant communities whose ability to survive are being threatened like never before. I am an immigrant to this country and my parents worked the asparagus feilds of Stockton when I was young. It's time that this generation remembers those struggles and sacrifices and takes a stand for those Filipinos living in the shadows of America today and fighting for their family's survival. San Francisco Immigrant Rights Hunger Strikers were in good spirits last night during their nightly candlelight vigils. The weather was a little warmer and the wind wasn't ripping through the concrete barriers surrounding the SF Federal Building as much last night. Richmond/San Pablo activist Marilyn Langlois who works with CALCARE, an anti-high stakes testing alliance, was there to support her fellow West Contra Costa County teacher/activist hunger strikers Raul Alcaraz and Cesar Cruz. RALLY: Saturday, March 25th, 2006, Noon at the FederalBldg. (Golden Gate and Larkin, SF) Teachers 4 SocialJustice. Media coverage from the progressive and alternative press has been good, but the mainstream press seem to be 'whiting out' the hunger strikers and immigrant communities in general. 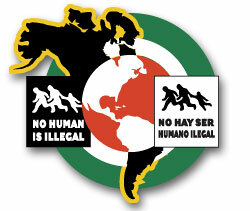 March 25-28 Nationawide Weekend of Actions to Support Immigrant Solidarity! I was fortunate to catch a special showing of the late Kayo Hatta's beautiful 1994 film Picture Bride [starring among others Tamlyn Tomita [Stargate-SG-1, Come See the Paradise, Joy Luck Club] and Youki Kudoh [Memoirs of a Geisha, Snow Falling on Cedars] and with a cameo by the legendary Toshiro Mifune] last night at the Center for Asian American Media's San Francisco International Asian American Film Festival. The film captures the struggle of women, families and Asian American immigrant workers in the plantation labor system of Hawaii. I used to use the film more in my Ethnic Studies classes at SF State in the 1990's. But watching the film again last night allowed me to marvel at its incredible cinematography [Claudio Rocha - Like Water for Chocalate], and its sharp political statement against racism, sexism and super-exploitation of immigrant workers and communities in America. The director, Kayo Hatta, passed away on July 20th last year in an apparent swimming accident. She was only 47 years old. I remember when I first moved out to SF in 1984, Kayo was a cultural and political activist who supported Asian American musicians and poets and community struggles. I remember visiting her at her North Beach/Chinatown apartment to borrow Asian American jazz albums for the radio work I was doing at KPFA and KPOO radio stations at the time. She was a great film maker, but more importantly to her friends and family an incredible human being. Her niece and nephew go to school at the JBBP-West [Japanese Bilingual Bicultural Program]/Rosa Parks Elementary School in SF. Their mom Julie has been active in the Asian American movement for decades. At the film showing Kayo's other sister Mari talked about Kayo's life and her struggle to make Picture Bride. To the delight of the audience as well, Tamlyn Tomita also talked about how the actors and film crew sacrificed to support Kayo and the making of the important film. 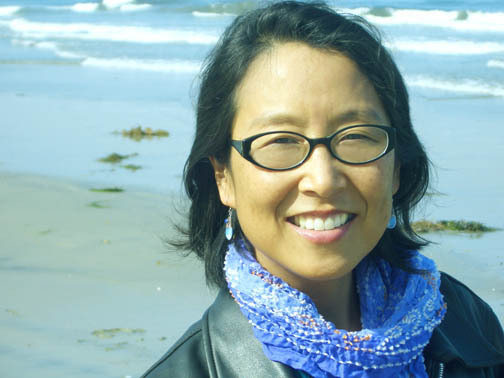 Kayo definitely lives through her films and the cultural and political stuggles she supported. Omnibus education bill in Sacramento? I understand that there is talk among lobbyists at the California Capitol of passing an “Omnibus” education bill which would bring together all the education interest groups. This proposal may well be dangerous to students of color and teachers. The groups discussing a grand bill, by rumor, include Secretary of Education Alan Bersin ( and Margaret Fortune), ACSA (school administrators), CTA, and more. CTA would get full funding for Prop.98 which is tempting. However, Bersin and Fortune have demonstrated severe anti teacher positions and their participation representing the Governor gives me cause for concern. These two, neither of whom have been teachers, represent the conservative corporate side of governance. Bersin’s proposals a few weeks ago were anti teacher, seeking to gain in the legislature what they were defeated about in Prop. 74. I encourage each of us to watch the legislative positions of our unions, associations, etc. and to be wary of any Omnibus education bill. There is no reason to trust these people. It might be better to fight for separate bills, such as adequate school funding, than to join together in an omnibus bill. Does anyone know more about this? As the saying goes, if you lie down with dogs, you wake up with fleas. We offer this conference each year: free to teachers and students. Social justice issues such as bilingual education and immigrants' rights will be at the core of Sacramento State's 12 th Annual Multicultural Education Conference beginning at 8:30 a.m. on March 25 in the University Union. The conference, "Education Reform and Social Justice Issues: A Grassroot[Re] Examination of Race, Class and Society," is directed toward K-12 teachers, student teachers, administrators, university educators, community members, activists, parents and all others interested in multicultural education issues. Antonia Darder, educational policy professor at the University of Illinois, will give a keynote address at 9:10 a.m. in the University Union Ballroom on motivating educators and teachers' organizations to become activists in a renewed educational vision. Born in Puerto Rico and raised in East Los Angeles, Darder is a poet and an activist whose life-long commitment has been to social justice, human rights and economic democracy. The conference includes sessions concerning parent/community involvement, leadership and advocacy, and peace and conflict resolution. The event is free and open to the public. For more information, call Maggie Beddow at (916) 278-4127 and for a complete list of topics and times visit http://edweb.csus.edu/. For media assistance contact the Public Affairs office at (916) 278-6156. Duane Campbell will be offering a presentation on Teaching about Cesar Chavez and a presentation on the current The anti immigrant legislation HR 4437 currently before the U.S. Senate would build a 700 mile wall along the U.S. Mexican border. ( The infamous Berlin Wall was only 46 miles long). 287 people died trying to cross it. The current U.S. wall is 70 miles long. At present some 3,500 have died trying to cross it. This workshop will analyze the current immigration conflict and search for progressive organizing alternatives. The March 18, 2006 anti-war march in San Francisco was as spirited as ever. With the incredible springtime weather, my daughter and I marched with the Strength in Unity contingent of students and grassroots people's organizations. I was proud to see so many SF State students representing LFS, ASU, La Raza, GUPS, and groups like the Chinese Progressive Association, Filipino Community Center, United Playaz, Asian Immgrant Women Advocates, CJWP, API Coalition Against the War and many others. 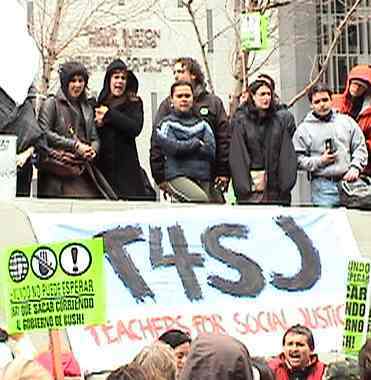 It was dry but cold out there today at the San Francisco Federal Building as longtime activist Renee Saucedo and 29 other San Francisco and East Bay teachers, students, parents and immigrants began a weeklong hunger strike for immigrant rights and justice. 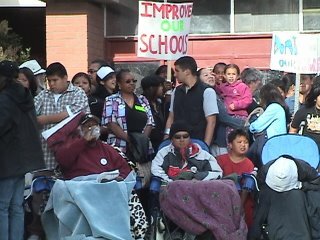 A number of the supporters included many SF State Raza students and teacher Clarissa Rojas. I also stood beside longtime Salvaroran community leader Ramon Cardona. My daughter Jade made a bunch of new friends including Saucedo's little doggy CoCo. 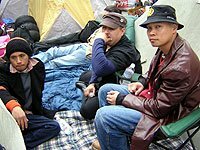 Renee and I participated in a similar immigrants rights hunger strike over 10 years ago at the same spot protesting the passage of CA's Prop 187 and the onslaught of anti-immigrant federal legislation at that time. 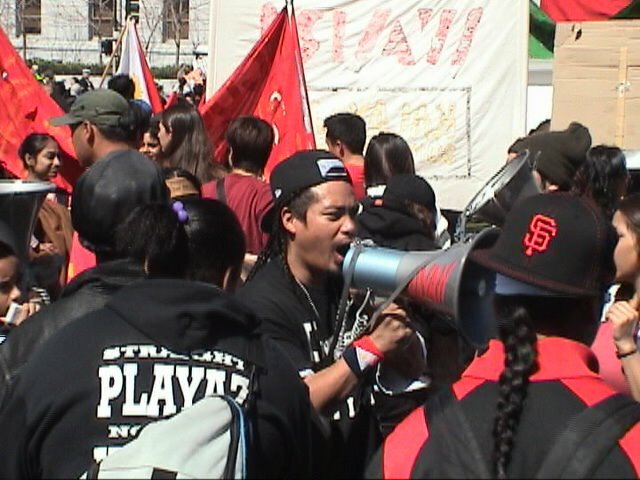 Tomorrow Wed 3/22/06 the Chinese Progressive Association and the May 1st Alliance [grassroots alliance of low wage worker organizations] are organizing a noon rally at the SF Federal Building. KTVU Channel 2 had a great segment on the hunger strike with good analysis of the anti-immigrant legislation currently being debated in Congress - the Specter bill in the Senate and the Sensenbrenner bill in the House HR 4437. For a great comparison of the various bills and their harmful impact on immgrant communities and civil liberties click here for the National Network for Immigrant and Refugee Rights analysis. Arnoldo Garcia of the National Network for Immigrant and Refugee Rights urged community members to call their senators to speak out against the 2 bills. Please come out to the SF Federal Building every evening after work from tonight 3/21 until 3/27 to support the courageous hunger strikers and our immigrant community organizations. Thank you for your recent letter in which you and 3 other Latino legislators ask for support of Steve Westly for Governor. We will consider your request and his record. In the meantime, may we point out to you in your role as Chair of the Latino Legislative Caucus that the California schools are in crisis. We have a Latino drop out rate of nearly 50%. Latino high school graduates read at about the same level as Anglo 13 year olds. Further, it is starkly noticeable that back in 1976 there were 5 Latinos in the California legislature and we were able to pass comprehensive bilingual education to assist immigrant students. Now, we have some 26 Latino legislators and you are not even able to be certain that English Language Learners have materials to assist them to learn English. Instead they are given materials designed for fluent English speakers. See the current issue before the California Curriculum Commission of the State Board of Education to provide appropriate materials for English Language Learners. We hope that the Latino Caucus finds it voice and focuses on matters of importance to our children. At the SF War Memorial Opera House on Sunday evening I was one of the few lucky people in the world! 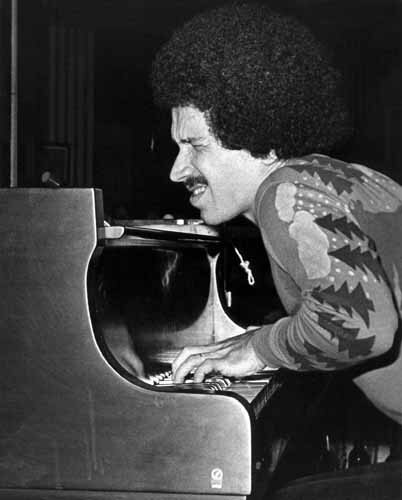 that experienced a rare solo performance by pianist extraordinaire Keith Jarrett. My older brother Ryan had seen a much younger Jarrett with the Miles Davis group in 1970 in Monterrey and again at the Winterland in SF. Besides Miles' band, he said the Grateful Dead also performed an amazing set that evening as well. I remember my twin brother Gordon, an alto sax player in high school and college, turning me on to Jarrett’s My Song album way back in 78 while we were both aspiring jazz musicians at McClatchy and Kennedy high schools in Sacramento. The folksy ‘country’ and the beautiful ‘my song’ were my favorites from on that incredible album. But what’s in my CD machine these days is Jarrett’s 1999 ballad album The Melody at Night With You that he dedicated to his wife Rose Anne with familiar standards like Someone to Watch Over Me, Shenandoah, and my 5-year old daughter’s favorite I Loves You Porgy. I understand Garrett suffers from Chronic Fatigue Syndrome and struggled to put that album together while recovering from CFS. It is inspiring that he manages to perform and tour despite his CFS. But the now 60 year old Jarrett played his heart out Saturday night with an amazing mixture of his new totally spontaneous ‘radiance’ music to tin pan alley-ish pieces and gorgeous ballads. The audience was so appreciative that Jarrett did 5 encores – which included standards like As Time Goes By and It Might As Well Be Spring! Jarrett’s self-reflection and constantly changing approach to his compositions and performances makes me think about the need for social justice activists and organizers to also constantly reflect on our practice and method as well. "Here I am a kind of mainstream accepted entity -- I have a big audience," Jarrett says. "Who else could take on the task or responsibility to try to burst another bubble that has been taken as reality? At the same time, I can explode my own myth. "It's like a pot of soup on the stove. If you don't stir it occasionally, stuff sinks to the bottom and burns. Just for a brief time, I think I can be the person with the spoon who stirs the soup." I think those of us working for educational equity and justice need to think and act like Keith Jarrett by always ‘stirring the pot’ and helping others, like students and parents to stir more from the bottom of the pot as well. On March 10, 2006, hundreds of thousands of immigrant community members and grassroots organizations marched and rallied in Chicago to demand Immigrant Rights and Dignity now. On February 25, 2006 hundreds marched and rallied in Oakland, CA's Fruitvale district as well. People are resisting the Post 911 scapegoating of immigrants and our communities all over this country. 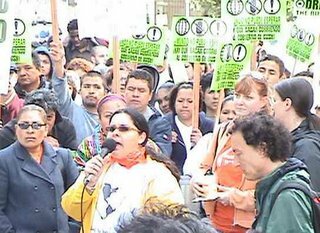 Over 10 years ago I participated with numerous grassroots organizations in an immigrant rights hunger strike in the aftermath of the passage of CA's Prop 187  and in the wake of the racist federal immigration policy changes  at that time as well. In San Francisco today, many of my comrades in the immigrant rights movement - from groups like the SF Day Labor Program, Chinese Progressive Association, Filipinos for Affirmative Action, Asian Immigrant Women Advocates and others - are supporting a new hunger strike beginning on Tues March 21 at the Federal Building in San Francisco. More info on the anti-immigrant bills. Please do what you can to help spread the word - SOLIDARITY NOW. March 22, Wednesday, 12pm the Chinese Progressive Association (415-391-6986) is coordinating participation of the May 1st Alliance, a multi-ethnicalliance of worker-based organizations, and the PressEvent in front of the SF Federal Building connecting African American and immigrant struggles and spotlighting the bills' impact on workers. 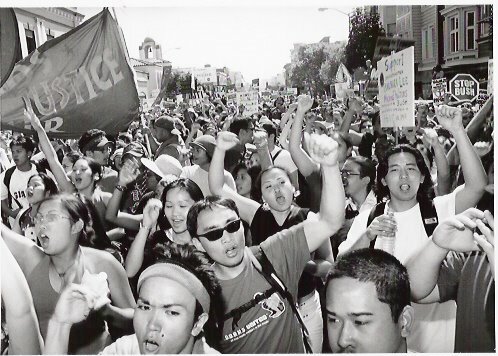 March 27, Monday, 11am Filipinos for Affirmative Action (510-465-9976) is coordinating the March toSenator Feinstein's office (Montgomery & Market) and the Press Event. You can also contact FAA if you want to volunteer to be a hunger striker. RALLY: Saturday, March 25th, 2006, Noon at the FederalBldg. (Golden Gate and Larkin, SF) Teachers 4 SocialJustice will have a banner, RSVP if you can make it! • Turn any person or organization that helps, employs,or provides any service to an undocumented immigrantinto a criminal, including family members. • Promote collaboration between federal immigrationagents and local police agents, promote the use ofstereotypes and discrimination against anyone that“seems” or “sounds” foreign. • Promote racial discrimination in employment,housing, and facilitate retaliation against anyimmigrant that defends her/his legal rights. • Militarize the border even more, which doesn’taddress the root causes immigration, but has causedmore than 4,000 deaths since 1994. • Will make it illegal to enter this country withfalse documents, which puts refugees and asylumseekers at risk, among others. Strength in Unity Contingent is sponsored by: International League of People's Struggle (ILPS) Bay Area, Asian Pacific Islander Coalition Against War (APICAW), BAYAN-USA, Al-Awda Palestinian Right to Return Coalition, Alliance of South Asians Taking Action (ASATA), American Friends Service Committee (AFSC) / Asian & Pacific American Community Program (APAC), AA Movement / Ezine, Asian Prisoner Support Committee, Asian Youth Promoting Advocacy and Leadership, babae, Chin Jurn Wor Ping, Chinese Progressive Association, Collision Course Video, Free Palestine Alliance, Korean Americans United for Peace, League of Filipino Students, Malcolm X Grassroots Movement and a growing list of allies and supporters against imperialist war and occupation. WE GOT TO RAGE AGAINST THE BUSH MACHINE! FROM IRAQ, PALESTINE TO THE PHILIPPINES! One of the best things about being a San Francisco school board member is participating with teachers and students in days of reflection and action like today's School of the Arts Assembly on ending racism. My friend Lani Silver, the head of the James Byrd Anti-Racism Oral History Project [Byrd was the African American man brutally killed in Texas in 1998], invited me and Public Defender Jeff Adachi to speak to the assemblies of hundreds of SOTA and SOTA Academy students. Many students spoke, including my colleague on the SF Board of Education, student delegate and SOTA student Jason Wong, on their experiences with racism and how it has impacted their lives. The amazing SOTA orchestra and concert band performed Chick Corea's Spain and a version of Rodrigo's beautiful Concerto De Aranuez. The jazz ensemble directed by Melecio Magdaluyo also performed a Stevie Wonder tune Too High. I told the students that they made me feel so 'at home' with their comments and their amazing performances. Thank you to my friend Lani Silver and Principal Donn Harris and all of you for inviting me this morning! I have one thing to confess first – When I was your age [30 years ago] at McClatchy High School in Sacramento [that’s where tomorrow’s speaker Jeff Adachi also went to school] – I wanted to be the next Miles Davis – I was a trumpet player – I did all the school musicals, and my life was music. Some of my heroes today are your teachers like Melecio and others who are trying to encourage and nurture the artists and leaders like you for our future. Some of miles davis’ bands and ones that were inspired by him were great examples of multiracial unity AND creativity. Racism and me – Growing up in Sacramento racism and my family’s internalized racism impacted me – part of the racism was the overt racism. Growing up in Sacramento in the 60’s and 70’s – very segregated; lots of racial violence towards Asians, Latinos and African Americans as I was growing up. But there was also the racism from school and the music industry that was not accepting of Asian American jazz musicians, or artists at the time. Also our urban school districts did not have the resources that other wealthier communities had as well – I call that institutionalized racism in the defunding/underfunding of our schools and public education in general. And lastly, there was the internalized racism in my family where family members refused to accept that I wanted to be - a jazz musician, not an engineer or a scientist - and that it was ok for young people like me to follow my dreams and to pursue what profession or career that would eventually make me happy. You and Activism – As you discuss how racism or other forms of oppression have impacted you personally I want you also to think about how you can become [more] active to address the inequalities that surround us as well. 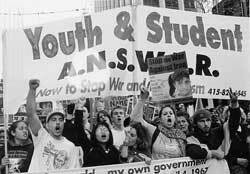 I didn’t really understand racism or racial oppression until I became a student activist in the 1980’s. College at uc davis and later at sf state helped me understand that racism is institutionalized and pervasive and imbedded in our US culture and it will take every one of us to identify, address and dismantle and change the institutions that perpetuate it. Drawing from one of my mentors Glenn Omatsu who teaches at CAL State Northridge, I always try to encourage students to learn about their history and to become involved in student and community organizations and movements. Learning the history of how students have been the main voices for social justice in America and throughout the world is key. If we have any hope of ending racism and building strong anti-racist movements for the future – you folks will have to take the responsibility to lead those new movements. Students like yourselves have always been the main proponents of social change in America - whether it was students in East LA high schools in the late 60’s fighting against racism, police brutality and racist conditions in the schools [check out HBO’s walkout [Edward James Olmos] later this week], or African American students challenging school racism and segregation throughout this country and in the Feb 1960 student sit-in movement and the Freedom Rides of the 60’s [Lani’s generation], or the 1968/69 Third World student strikes at SF State and UC Berkeley that opened the doors of higher education to me and millions of working class and students of color to learn about our true history and to use our education to serve our communities. You stand in the shoes of those students that came before you and have a responsibility to carry on in that tradition. March 18th Global Day of Action to Stop the War on Iraq! Bring the Troops Home Now! End Colonial Occupation from Iraq to Palestine to Haiti… From Iraq to New Orleans, Fund People’s Needs Not the War Machine! and to support local struggles like the African American community's efforts to resist the new gentrification and redevelopment of the Bay View Hunters Point neighborhoods, the efforts of some of my SF State students to prevent the 'sale of Japantown' to corporations and the destruction of that commuity, and lastly the work of a number of local SF immigrant rights organizations who are holding a hunger strike for immigrant rights at the Federal Building in SF from 3/21-27. The students and teachers are amazing at SOTA, but also at all of our high schools throughout the district. They are the leaders for our future. For more info on Lani Silver and the James Byrd Jr. Racism Oral History Project, or to request a brochure, please write to P.O. Box 27333; San Francisco, CA 94127 or call (415) 415-485-4208. The oral history project can be reached at mailto:%20Byrdproject@aol.com. If you would like to reach the Byrd Foundation for Racial Healing write to: 12180 Greenpoint Drive, PMB #244, Houston Texas 77060. You can e-mail the Foundation at Byrdfound@juno.com or call (888) 856-6414.